NEW ZEALAND FREE LANCE May 10, 1938. IT was with pride that Lady Russell, of Tunanui, Hastings, watched her husband march through Sydney at the head of the New Zealand returned men on Anzac Day. With a party from Government House she had an excellent place of vantage from the balcony at Parliament House in Macquarie Street. 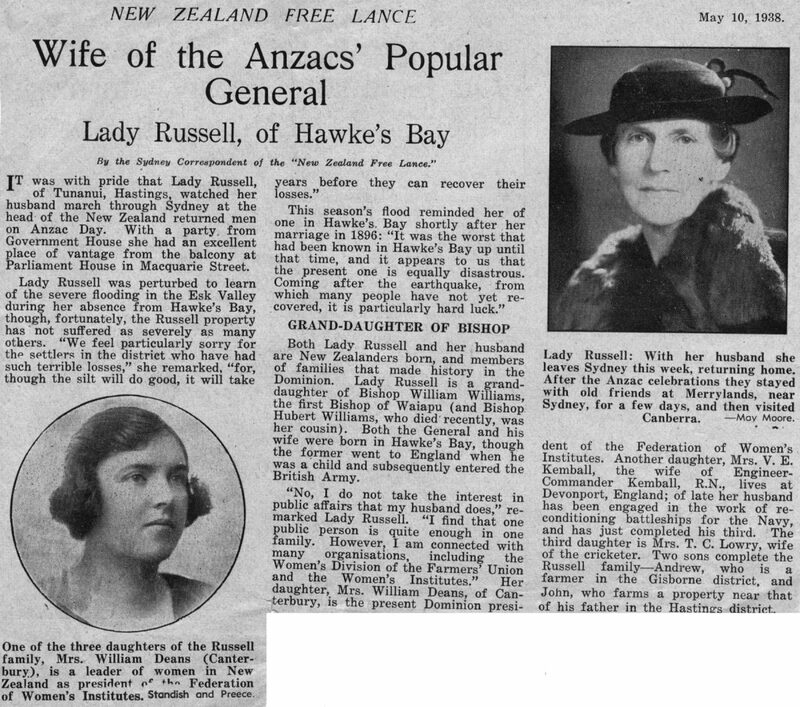 Both Lady Russell and her husband are New Zealanders born, and members of families that made history in the Dominion. Lady Russell is a grand-daughter of Bishop William Williams, the ﬁrst Bishop of Waiapu (and Bishop Hubert Williams, who died recently, was her cousin). Both the General and his wife were born in Hawke’s Bay, though the former went to England when he was a child and subsequently entered the British Army. “No, I do not take the interest in public affairs that my husband does,” re-marked Lady Russell. “I ﬁnd that one public person is quite enough in one family. However, I am connected with many organisations, including the Women’s Division of the Farmers’ Union and the Women’s Institutes.” Her daughter, Mrs. William Deans, of Canterbury, is the present Dominion president of the Federation of Women’s Institutes. Another daughter, Mrs. V. E. Kemball, the wife of Engineer-Commander Kemball, R.N., lives at Devonport, England; of late her husband has been engaged in the work of re-conditioning battleships for the Navy, and has just completed his third. The third daughter is Mrs. T. C. Lowry, wife of the cricketer. Two sons complete the Russell family – Andrew, who is a farmer in the Gisborne district, and John, who farms a property near that of his father in the Hastings district. Lady Russell: With her husband she leaves Sydney this week, returning home. After the Anzac celebrations they stayed with old friends at Merrylands, near Sydney, for a few days, and then visited Canberra. – May Moore. One of the three daughters of the Russell family, Mrs. William Deans (Canterbury), is a leader of women in New Zealand as president of the Federation of Women’s Institutes. Standish and Preece.